Hello Beauties and Happy Easter Weekend! As my last baking post went down so well, I thought I would share with you all an Easter cake which me and my Mum whipped up last night. I actually used the recipe from my last baking post to bake the cake and make the icing, so I won't go through it all again, as really you can use any kind of chocolate cake and chocolate buttercream icing, but if you'd like to follow the recipe exactly, you can find my chocolate cake recipe here. A ribbon to wrap around the cake (also optional). Step 1: Once you've placed your cake on your cake stand or plate, whatever you want to use, spread some of the buttercream icing over the top of the cake. This will need to be fairly thick so that the mini eggs have something to sink into. 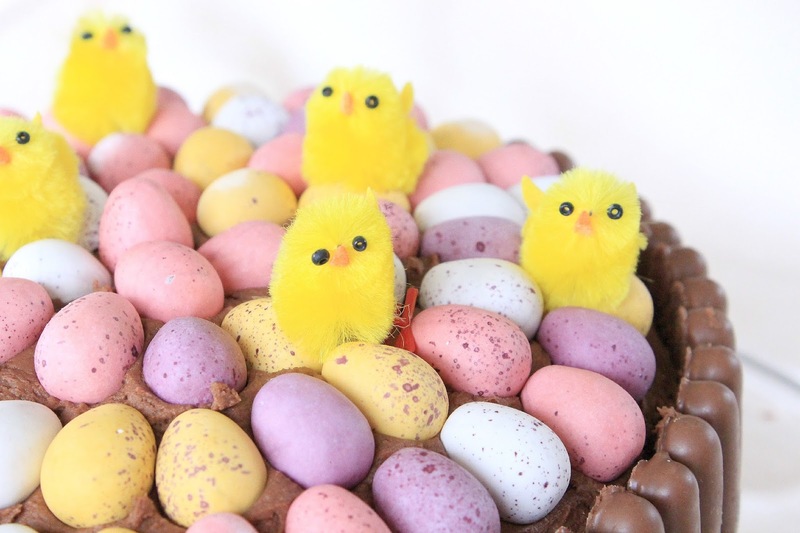 Step 2: Start placing your mini eggs around the edge of the top of the cake in a circle shape. I started on the outside of the circle and worked my way in which I found was easier. Keep going with this until you've completely filled the circle. Step 3: Once the top of the cake is completely covered, spread the rest of the icing around the edge of the cake so that the chocolate fingers have something to grip on to. Or alternatively, you can apply the icing directly to each chocolate finger. Once the outside of the cake is fully coated with icing, start placing the chocolate fingers round the edge to make the 'fence' design. Step 4: Cut your ribbon to the correct length and tie in a bow around the cake. Once you've done this, place your chicks onto the top of the cake to decorate. It really is as easy as that! 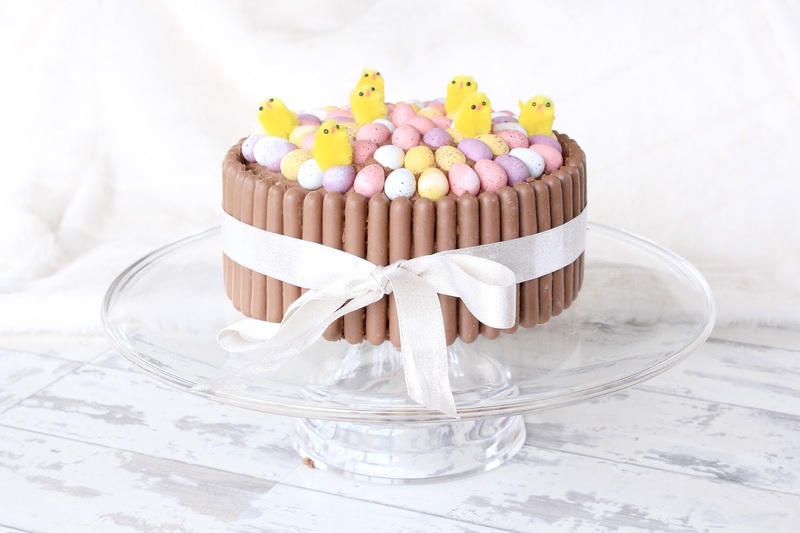 I think the cake looks a lot more complicated than it actually is and will make the perfect cute little centrepiece for any Easter dinner over the long weekend. If you do decide to bake this, please tweet me your pictures as I'd love to see your creations! That cake actually looks amazing, good job! This is gorgeous and you make me want to bake and eat chocolate cake. You did such a great job with this Becky. This cake is adorable, will be trying this recipe tomorrow! Wow this cake looks incredible! You're so talented.